I have a confession: when I first heard that my alma mater, The University of Notre Dame, drew the Clemson Tigers in the four-team College Football Playoff for a chance to reach the National Championship game, my first reaction was that my beloved Fightin’ Irish don’t stand a chance. Clemson is a stacked football team. With a roster loaded with future NFL players, the Tigers have been unstoppable recently. Since October, all eight of their wins have been by at least 20 points. Oddsmakers have Clemson as a 12.5 point favorite: a staggering number for a game of this magnitude. If these are two of the top four teams in the country, shouldn’t they be more evenly matched? I know what you’re thinking, fellow Irish fans. Yes, we had a great year, too. We’re a different team with quarterback Ian Book under center. We’re well-coached, disciplined, and balanced. We deserve to play in this game. It’s true. But we also deserve to be significant underdogs. Rivalry weekend featured #6 USC (10-1) against #7 Notre Dame (10-1), in a high-stakes contest with a BCS bowl bid likely on the line. My family and I crowded around our 22” Sony with visions of Orange dancing in our heads. Then the game happened. USC outgained the Irish, 610 yards to 109. Carson Palmer threw for 425 and four touchdowns. The only Irish touchdown came from a blocked punt. In 2005, Notre Dame hired New England Patriots Offensive Coordinator Charlie Weis, fresh off a couple of Super Bowl wins. He got off to a promising start as head coach in 2005. Unranked in the preseason, the Irish rode the right arm of Brady Quinn to a Fiesta Bowl berth against Ohio State and finished the year ranked #9. Sounds like a good year, right? Not to Weis, who boldly proclaimed “9-3 is not good enough” after being pummelled by the Buckeyes, in a contest best remembered for the “split jersey” for OSU-ND worn by Quinn’s sister Laura, rather than anything that happened on the field. 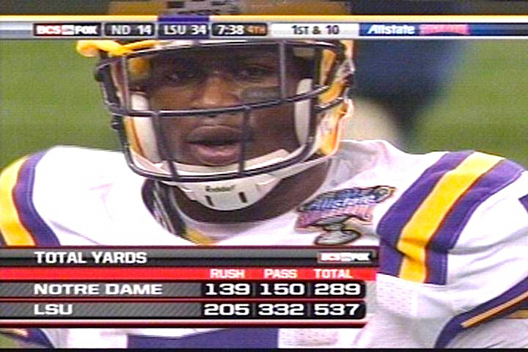 Biggest Game: 2007 Sugar Bowl vs. LSU. As I entered my freshman year at my dream school in the Fall of 2006, I handed over $220 from a summer of caddying in exchange for season tickets and a hand towel bearing Weis’ words. The Irish entered the season ranked #2. I was convinced: after nearly two decades of mediocrity, Notre Dame was back. JaMarcus Russell had different ideas. The Irish were thoroughly outclassed yet again. Weis was sent packing by my senior year, with $65 million as his parting gift. Result: Alabama 42, Notre Dame 14. It’s 28-0. And it’s only halftime. Hope you’re enjoying your retreat! P.S. Te’o’s girlfriend isn’t real. Three big games. The highest of stakes. 44-13. 41-14. 42-14. When you look at the Irish’s past performance on the biggest stage, suddenly 12.5 points doesn’t seem so unfair. This past Sunday, I was at a family gathering, flush with Irish supporters. Here are a few snippets from that conversation. Ian Book has been incredible on third down. If we can dominate the time of possession and keep them off the field- we might actually have a chance. Sure, Clemson’s been dominant, but who have they really played? The ACC is so weak this year. They’ve got more talent than the Irish, but I could see this going our way. We’re due. I love that we’re the underdogs. Everyone is counting us out, which gives us the perfect opportunity to leave it all on the field. With past memories of Irish flops so firmly in mind, why was I nodding my head in agreement to these comments? How am I talking myself into something I something I know to be unlikely, even irrational? Maybe it’s because unpredictability is what makes sports so damn fun. The Miracle on Ice. David Tyree’s “Helmet Catch.” #16 UMBC rolling #1 seed Virginia in last year’s March Madness. These are the type of games and teams we will remember and cherish. We talk ourselves into upsets not so much because they are possible but because they are memorable. With as much time, energy, and love we put into our teams, our schools, our cities, we deserve the occasional unbridled elation that comes when the doors of our expectations are blown off. I recently looked up the odds for an Irish upset on Saturday: 28.5%. For every four times the Irish play Clemson, they should expect to find a way to win once. With those three Irish losses firmly in my mind, I can’t help but feeling, maybe this is our year. Share Are the Irish For Real this Time?